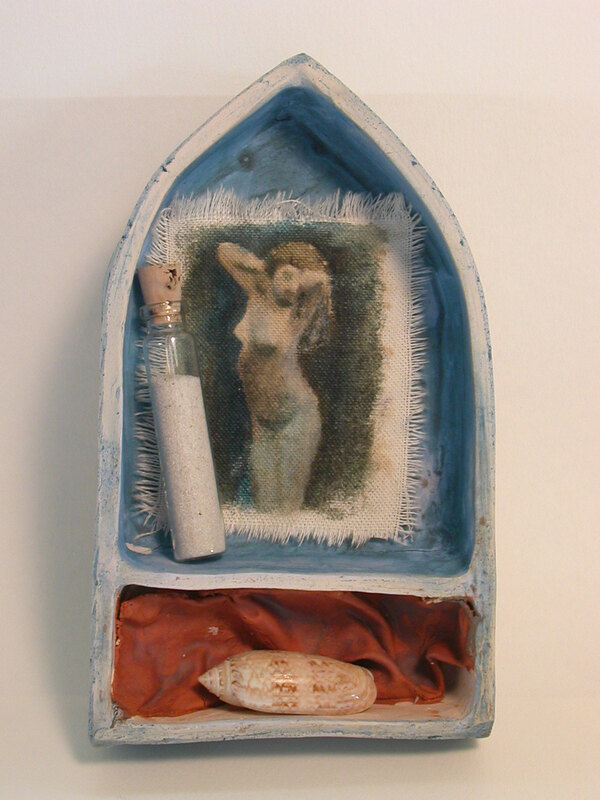 Stoneware, shell & skate egg case, bottle, sand, artist’s book. The inspiration for this piece was the Celtic myth of the selkie, who sheds her seal skin and lives life on land as a mortal woman. 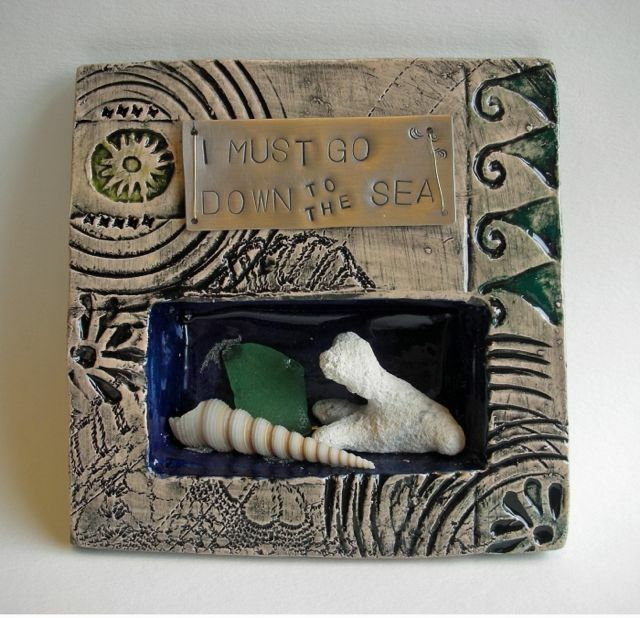 I envisioned the treasures she would collect, and enshrine, to pay homage to her ocean home. 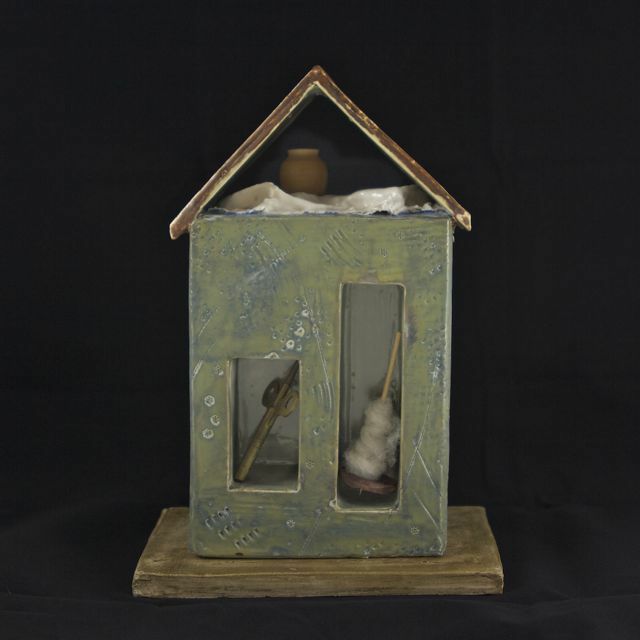 Stoneware, antique key, wool roving, found objects. 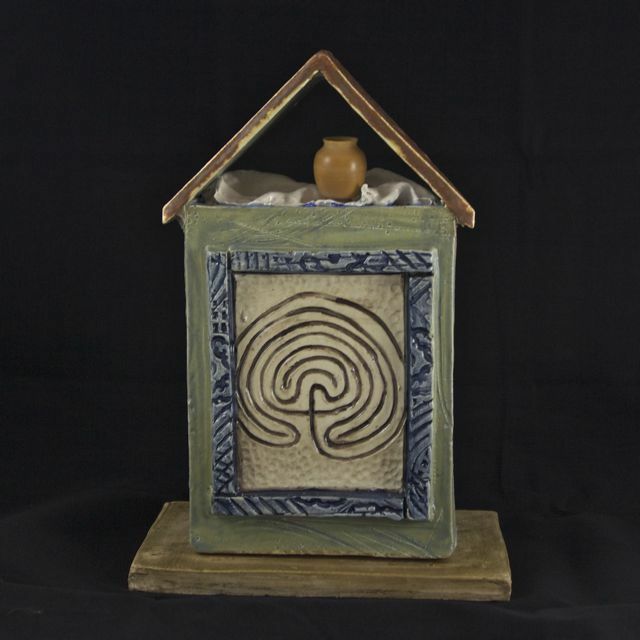 Detail of the back with carved Cretan labyrinth. 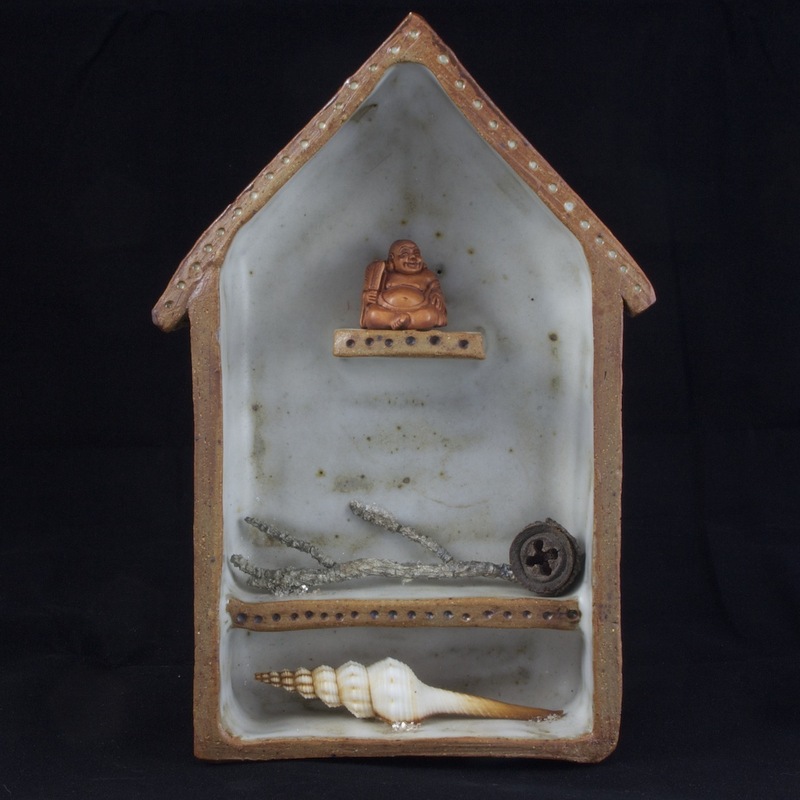 Stoneware clay, shell, eucalyptus pod, pewter branch, carved rosewood netsuke. I took this photo at Mission San Juan de Capristrano. 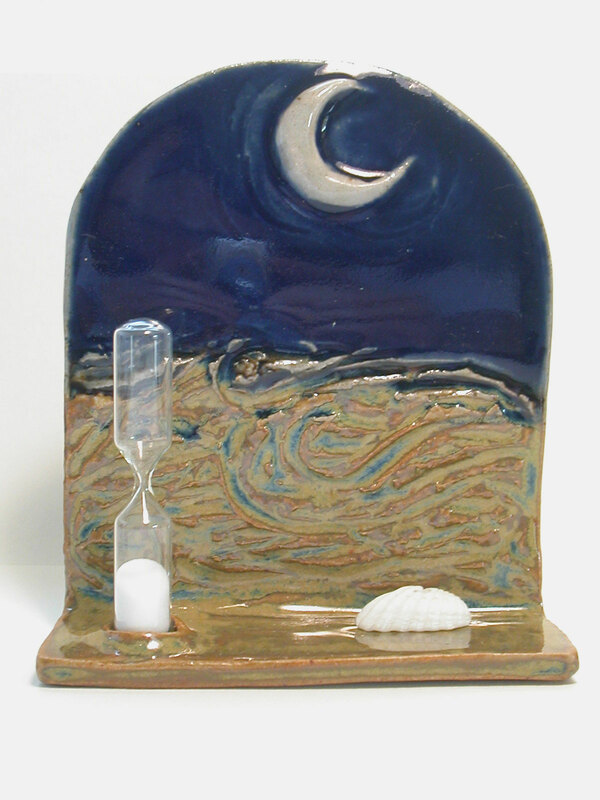 The image is tranfered onto canvas and included here with an hourglass and sea glass. 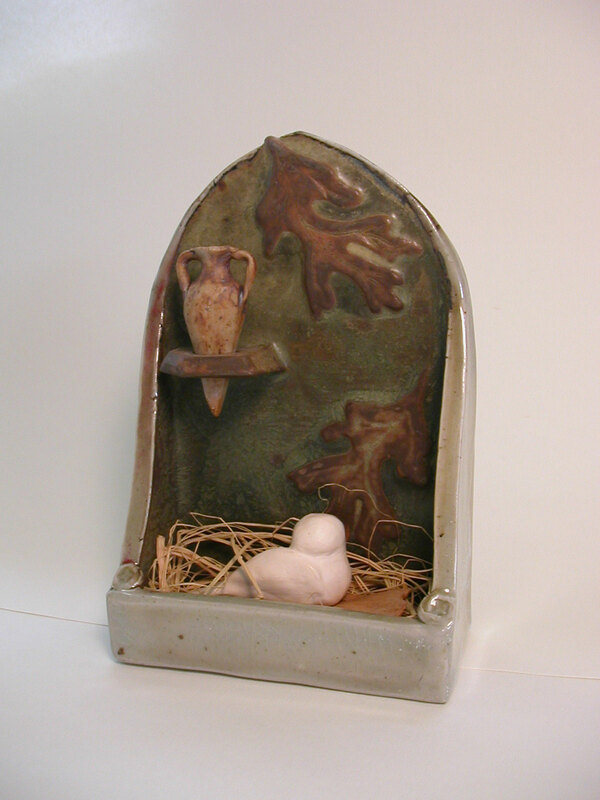 At the oracle of Dodona in Ancient Greece, priestesses known as “doves” served Zeus. They interpreted prophesies heard from the oak leaves rustling, and the songs of the copper vessels hanging within the trees. This mermaid image is inspired by the Mermaid of Zennor; a Medieval wood carving on a church pew in Zennor, Cornwall. 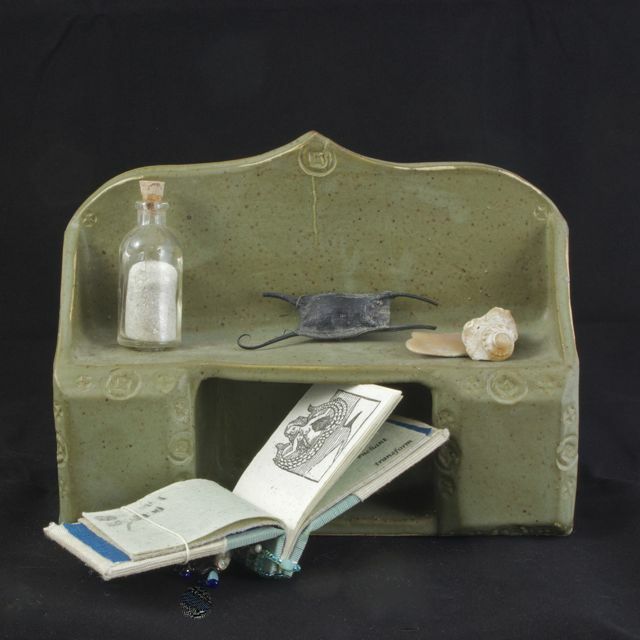 Stoneware clay, bottle, compass, river rock, artist’s book. 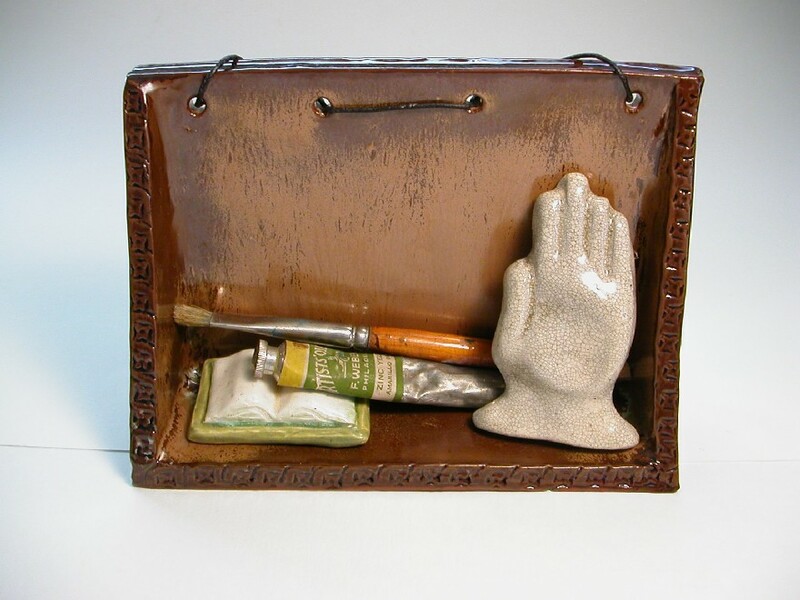 Earthenware clay, ceramic hand and book icons, vintage paint tube and brush. 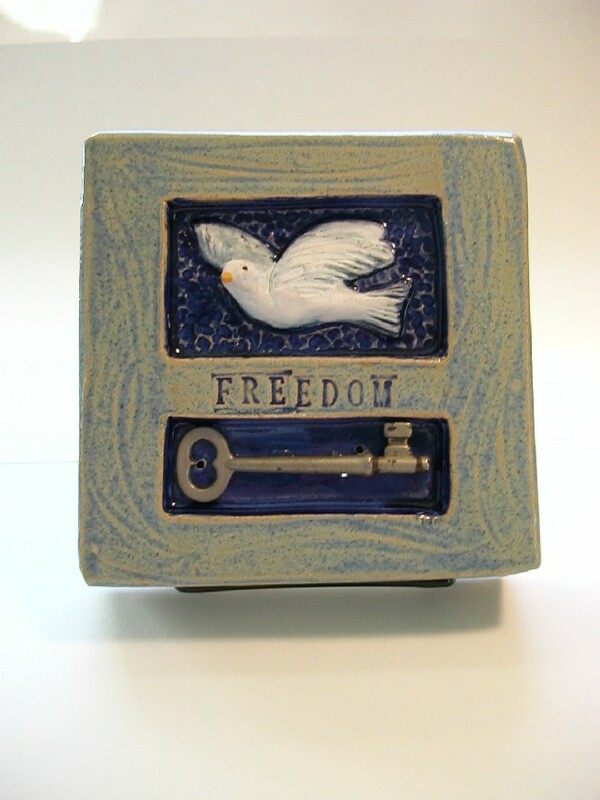 Simply inspired – there is a joy to making, to creating, and sharing the work of your hands with others. 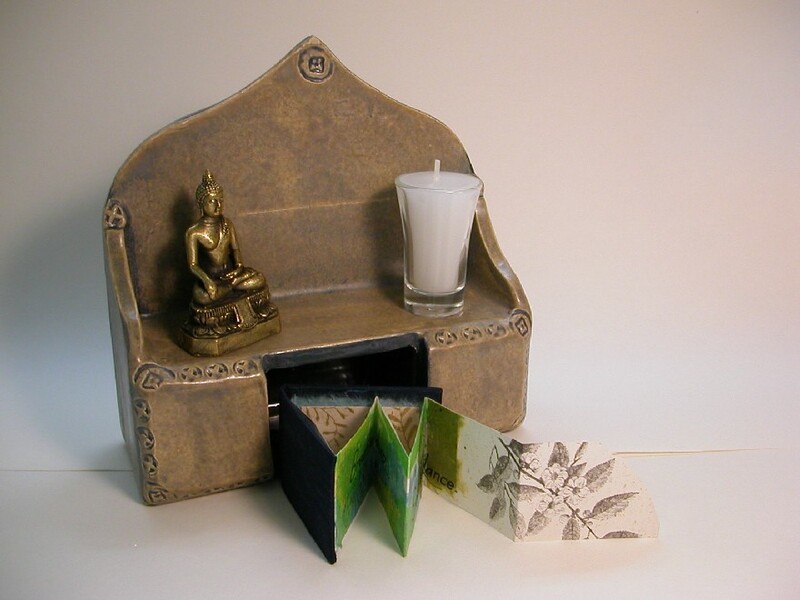 Earthenware clay, brass statuette, candle, shell and seed pod, artist’s book. 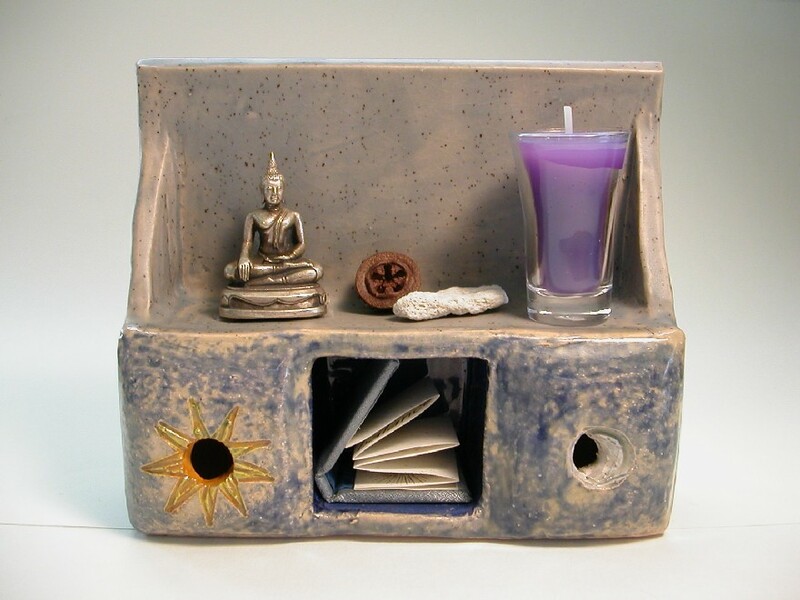 In this style os shadowbox shrine, I enjoy combining the sculpted relief images from my tiles with enclosures and found objects. 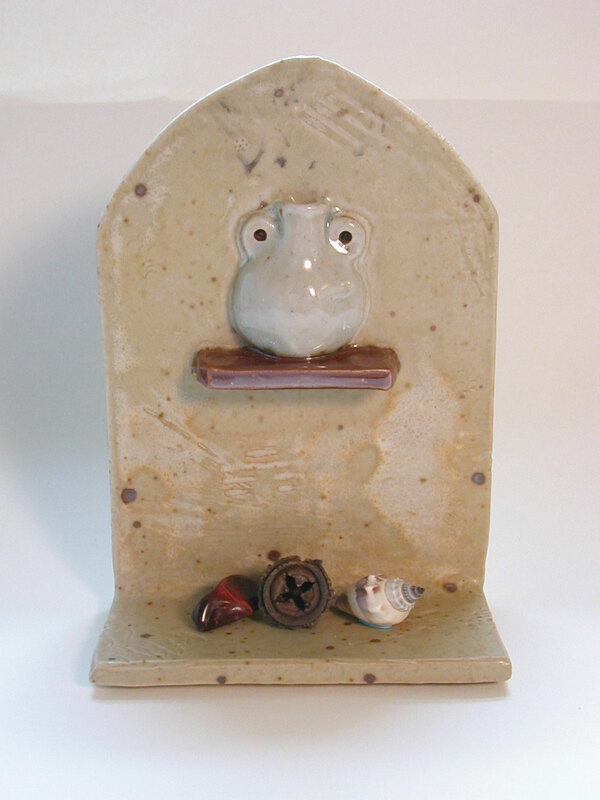 Earthenware clay, nickel silver, shell, coral, sea glass. 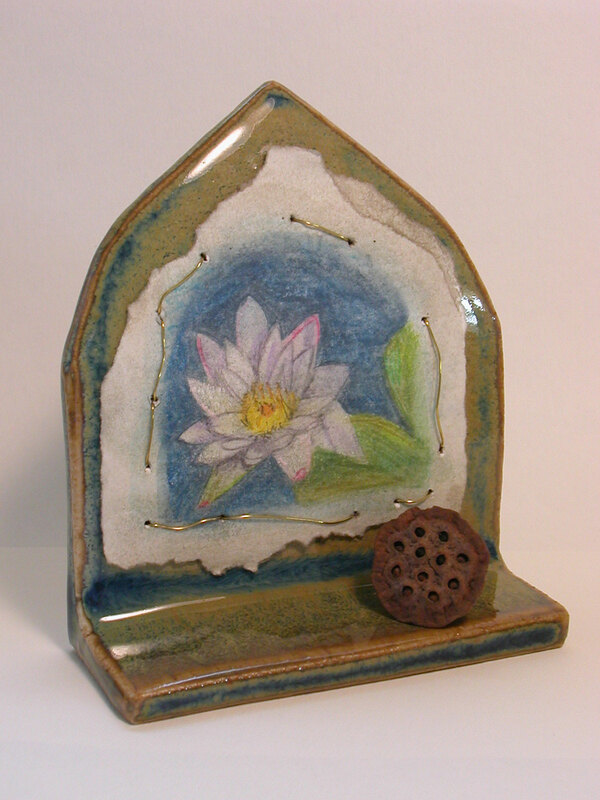 Stoneware clay, lotus pod, colored pencil on watercolor paper, wire. Inspired by Stonehenge in the UK – the antler references archaeological finds from the site. 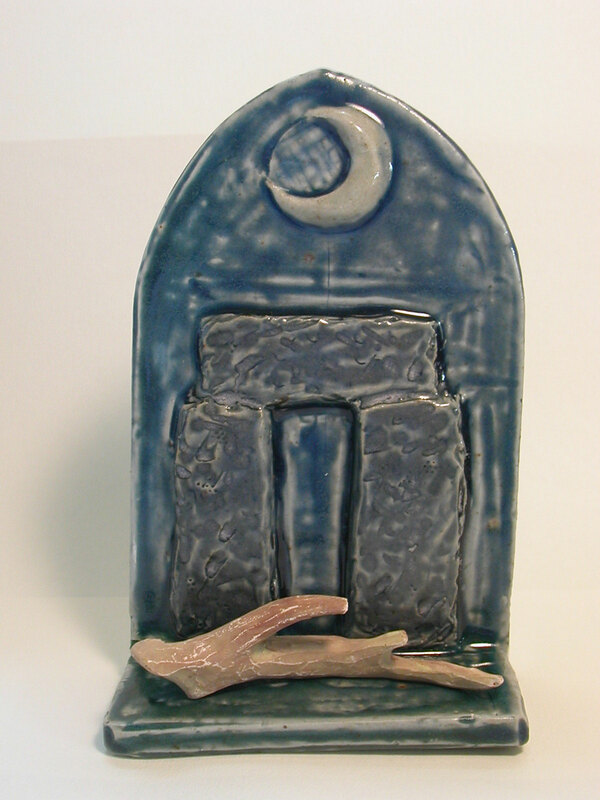 Antler and moon also represent the duality of male/female. 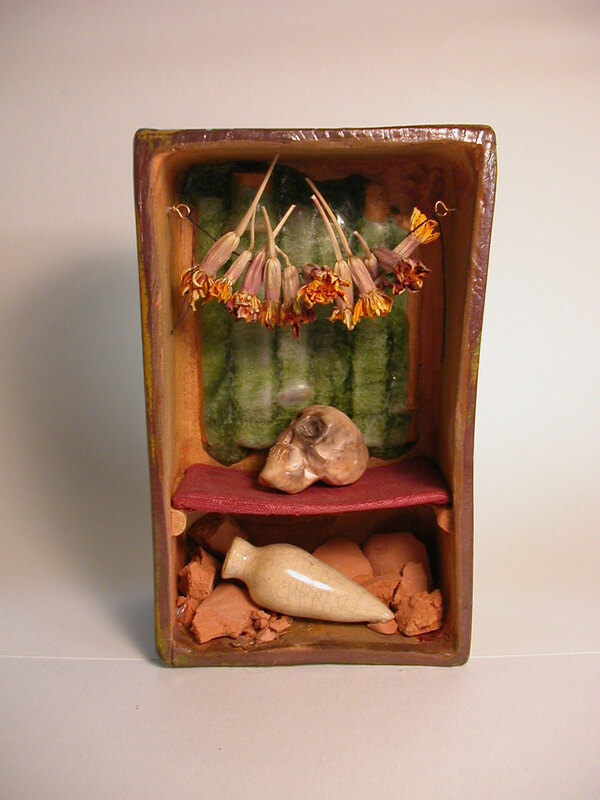 Earthenware and terra cotta clay, terra sigilata, pebbles. 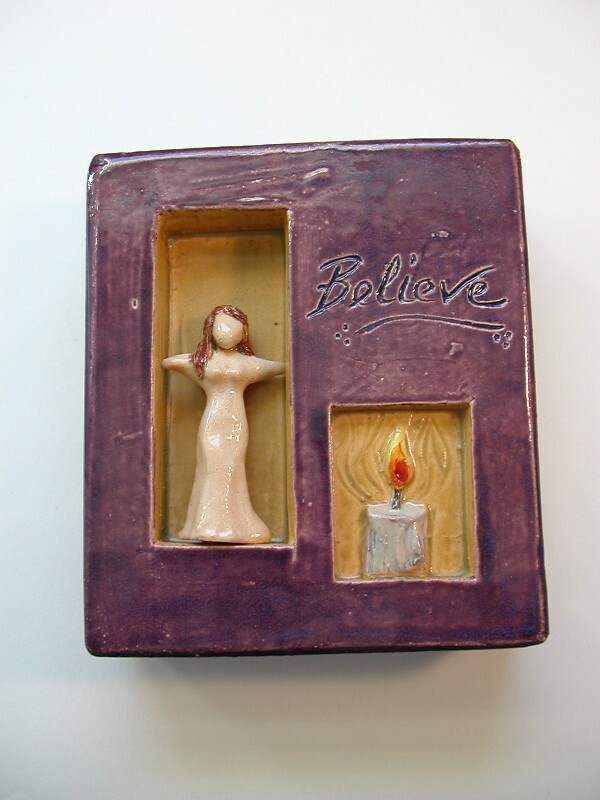 This was one of the first shrines, exploring motifs of the feminine divine. 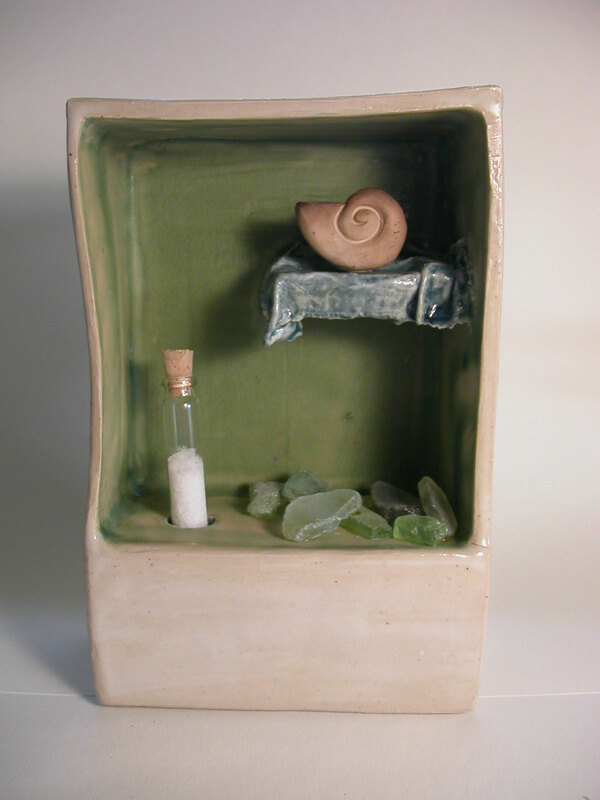 Stoneware clay, canvas, shells, vial and sand. 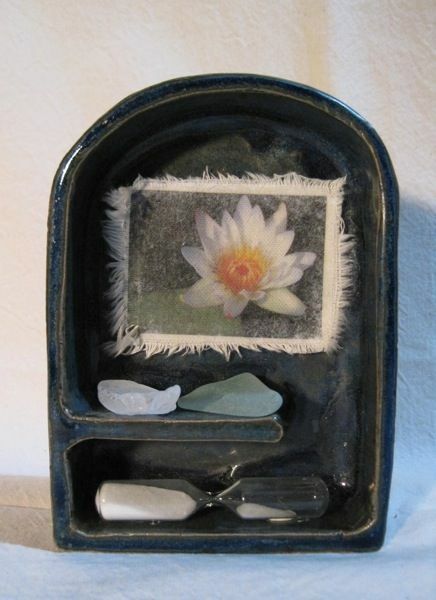 Stoneware clay, stained glass, terra cotta shards, dried marigolds, silk. 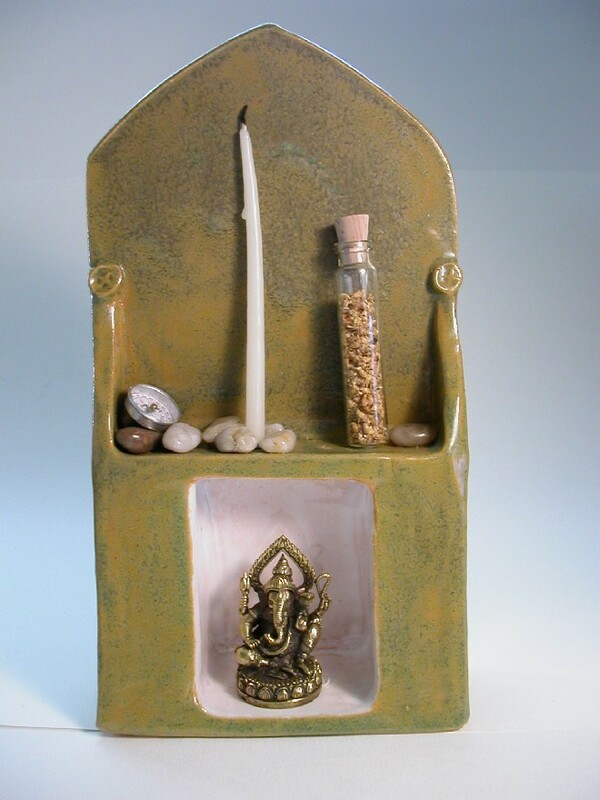 Stoneware clay, brass statuette, pebbles, compass, candle, vial of herbs. 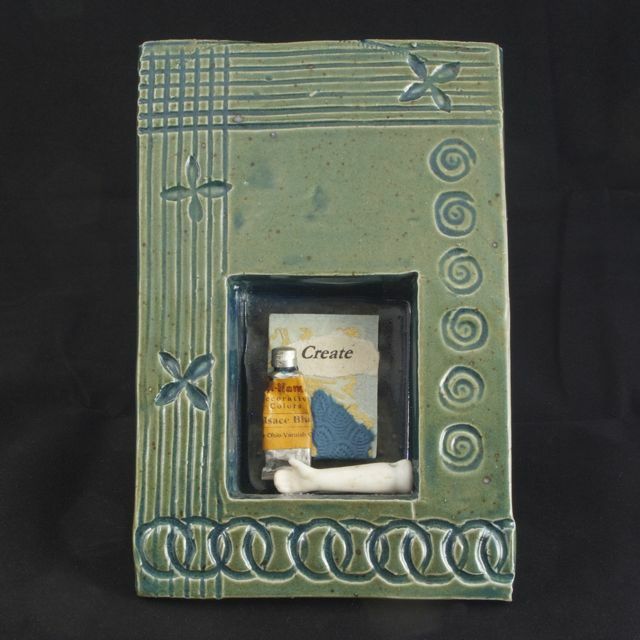 Earthenware and terra cotta clays, canvas, paint, glass vial, sand, shell. 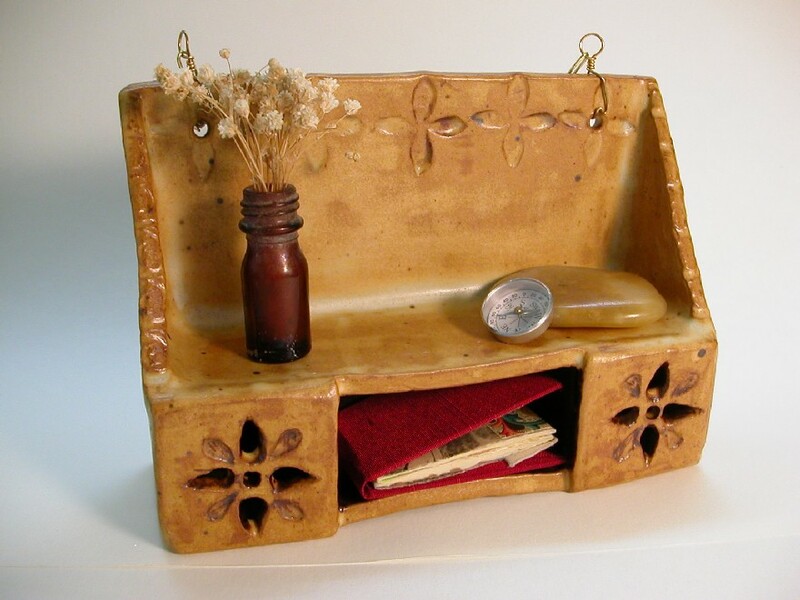 Earthenware clay, shell, eucalyptus pod, tiger’s eye. 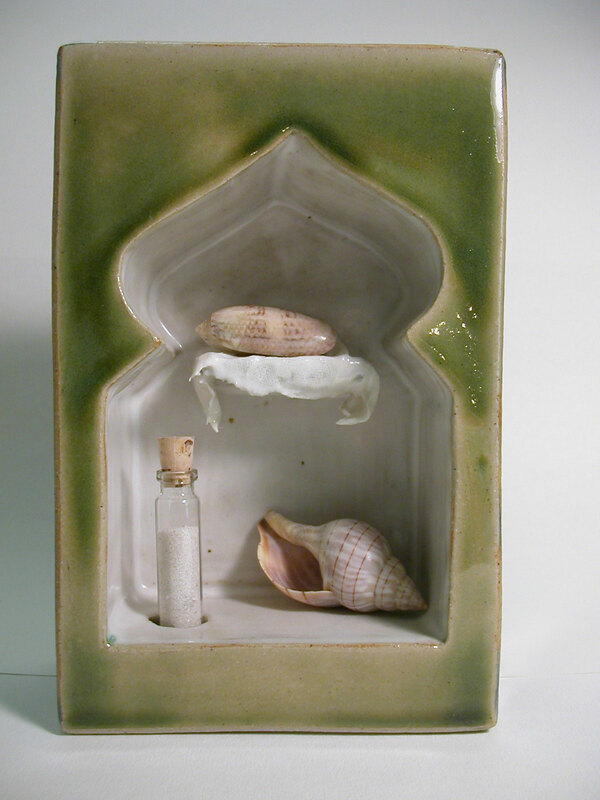 Stoneware, porcelain, sea glass, glass vial of sand. 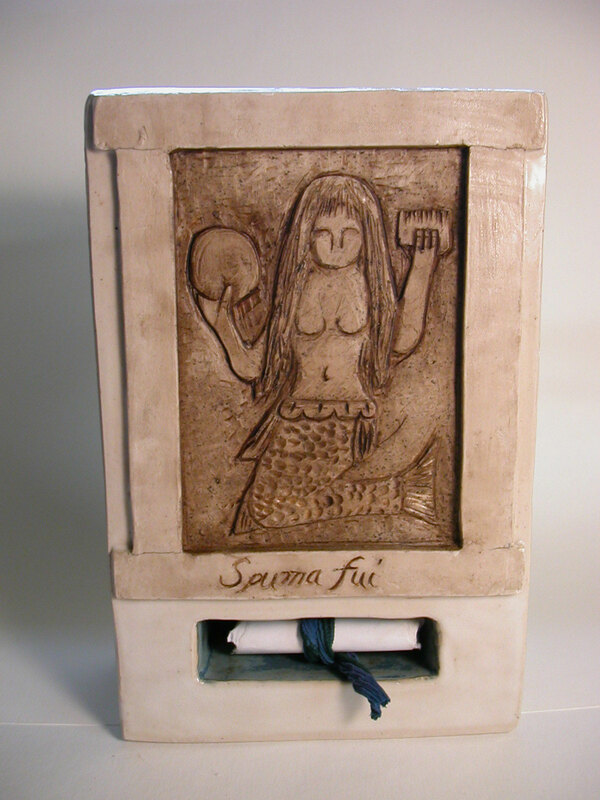 “Spuma Fui” loosely translates as ” I was foam myself”. 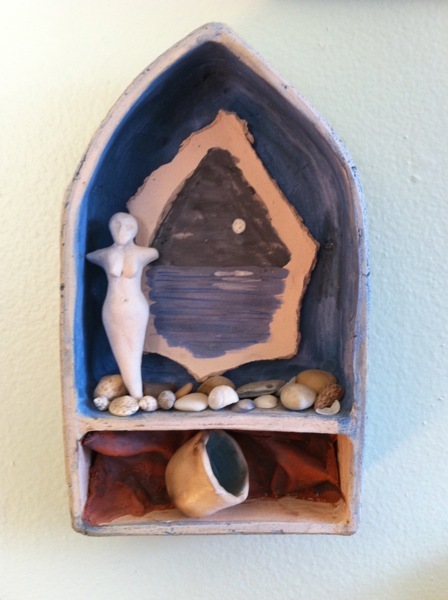 This was inspired by tales of mermaids and sirens who leave the ocean to walk on land as human women. 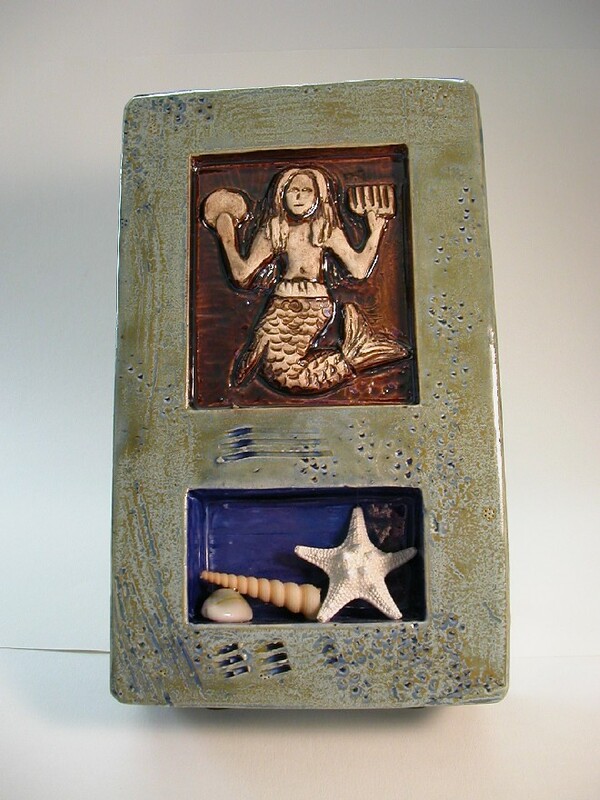 Showing mermaid carving and secret message scroll. 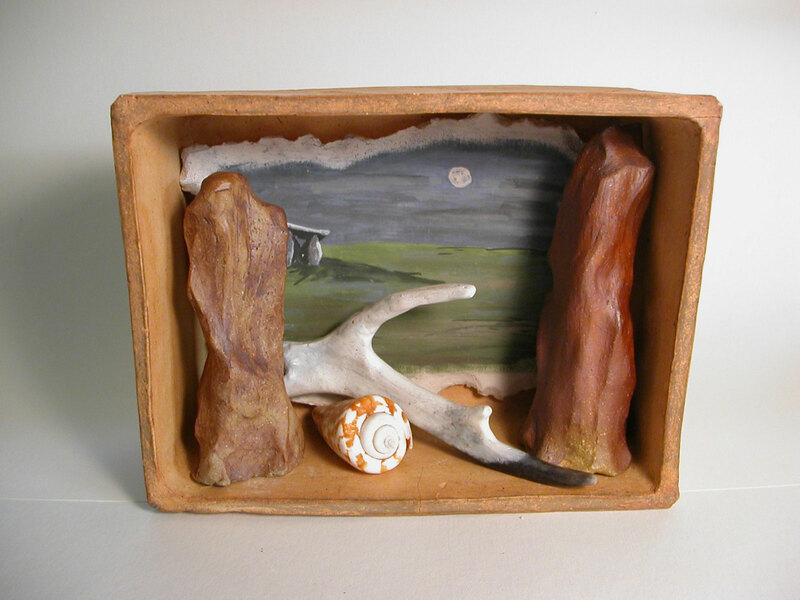 Stoneware clay, pit fred ceramic antler, shell.